Canapés are a great starter to serve to a large group. 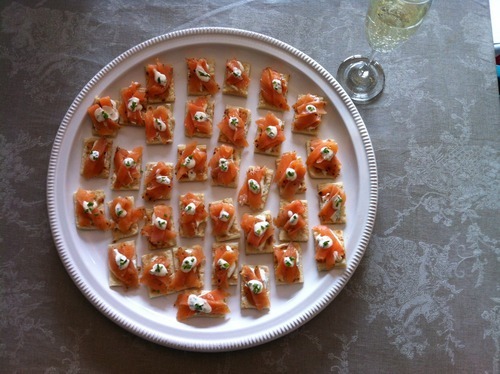 These smoked salmon canapés are always popular and go very well with a glass of Champagne! In a bowl stir together the crème fraîche, horseradish, salt, pepper and chopped chives. Spoon ½ teaspoon of crème fraîche onto each potato farl, then drape a piece of salmon on top, spoon on another ½ teaspoon of crème fraîche and sprinkle with chives. Serve with a glass of Champagne.